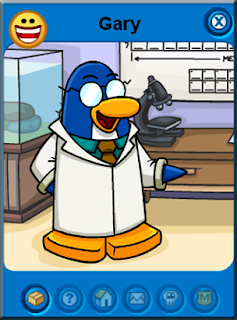 Gary the Gadget Guy (AKA Agent G), is Club Penguin's inventor and scientist and also the former owner of the Sport Shop. He likes wearing a white lab coat and his special twisted spectacles, and enjoys eating fish Dish Pizza, and is almost always seen drinking coffee. He always is inventing new things for the island! He builds many things helpful to Club Penguin and can be seen waddling the island on special events. Gary is very shy. He does not like to be crowded. He only comes on special events! He is on 2-4 bars high, and is often in a lab or somewhere where a invention is located. To figure out when hes on Club Penguin Visit this website! 4. He does NOT have a igloo. He works in his lab. 5.He does NOT have post cards. Although you can get a special background from him he has 2!